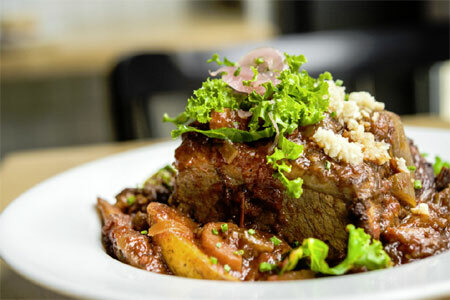 Meat-centric farm-to-table fare on the Lower East Side. : This cozy Lower East Side spot is filled with mismatched wooden tables and creaky chairs. It’s an unassuming place for a menu with such purity of vision. The wine list is sparse, noting some lesser-known wineries --- it’s as if the beverage director wanted to make sure everyone discovers something new. Along the same lines, every month the restaurant pairs with a farmer to provide one type of meat (duck, rabbit, lamb, etc.) that the chef uses in a concise list of entrées, so every month the offerings change completely, with a few exceptions. Di Palo’s burrata accompanied by warm ciabatta bread with a shatteringly crisp exterior should never leave the menu. Nor should the salad with lots of foraged microgreens, garnished with tiny flowers in pink and purple hues. Meat is often present in some form of hot or cold ramen, and almost always as a sandwich on the aforementioned ciabatta. The dessert line-up is equally brief: butterscotch pudding, a milk cake or various flavors of ice cream from artisanal OddFellows.